Tags are used to define data source communications, alarm limits, and other real-time signal properties like Time On and Counts for keeping track how long a point has been on and how many times it has transitioned in a given period. Tags are common data sources to all clients. Data Sources can be setup to communicate with Modbus, Allen Bradley, Siemens controllers, MQTT, and OPC Servers. To use data directly from a Visual Studio application use the default data source of Value as a fixed value that can be changed using the OPC Controls Data component. Tags can also be used to setup Calculations from other local and remote Tags. 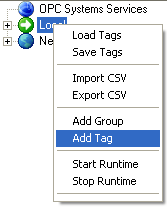 The following section is how to manually add and define Tags using the Configure OAS application. 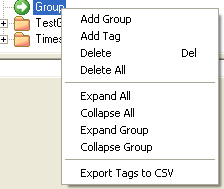 Tags can also be added and modified using the CSV Import and Export selections using the Configure-Tags application to use Excel or other third party Comma Separated Variable editor. To learn how to programmatically add or modify Tags from your own Visual Studio application refer to the Programmatic Interface – .NET Programmatic Configuration – Programmatic Access CSV Import and Export on how to add and define multiple tags with one method. 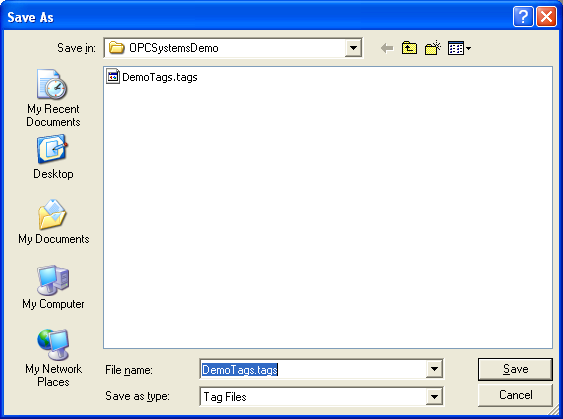 For a complete list of all Tag properties refer to the OAS Configuration – Tags section in this help file. If you already have the default Demo Tags loaded you can right in the list of tags to the right to Delete All Tags. Right-Click on the Local OAS Service and select Add Tag. You can also add organizational Groups as many levels deep as you prefer and add tags to groups. To do this first add a Group to the root level, then right click on the Group in the right window to add additional Groups or Tags. 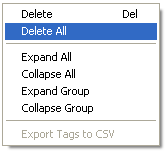 Enter the Tag name Ramp in the Add Tag dialog box. Repeat Steps 4 and 5 with Tag name Sine. Repeat Steps 4 and 5 with Tag name Random. Select Tag Ramp in the right Tag window. 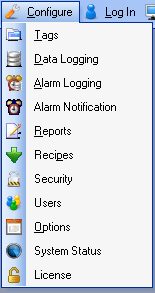 All Tag properties will appear in the lower window. For the Value Parameter set the Data Source to OPC Item. Use the OPC Browse button at the right of the OPC Item to browse OPC Servers. Expand Local to expand EEI.OPCSimulator and select SimDevice. Select Ramp from the list of OPC Items and select OK to enter the OPC Item EEI.OPCSimulator\SimDevice.Ramp. If you plan to use trending on this point enable the Trend Point option in the upper right of the Tag Properties window. Set the Description field to Ramp. Select the High High Parameter and set the Value field to 80 and enable the High High alarm. Select the High Parameter and set the Value field to 60 and enable the High alarm. Select the Low Parameter and set the Value field to 40 and enable the Low alarm. Select the Low Low Parameter and set the Value field to 20 and enable the Low Low alarm. Select the Apply Changes button in the lower right corner. Select Tag Random and the Value Parameter. Repeat Steps 8 through 14 and Step 19 substituting Ramp for Random as Tag name and OPC Item name. Select Tag Sine and the Value Parameter. Repeat Steps 9 through 19 substituting Ramp for Sine as Tag name and OPC Item name. Use 0.9 for High High Value, 0.8 for High Value, 0.2 for Low Value, and 0.1 for Low Low Value. Create a directory on the local C:\ drive with the name OPCSystemsDemo.